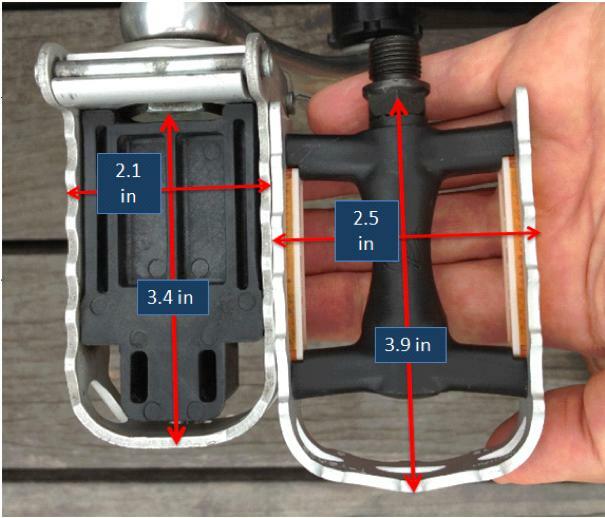 Q: How much smaller is the Brompton folding pedal than the non-folding pedal? A: More than it looks! The black reflector housings make the pedal look ‘longer’ (front to-back) than it is, but they don’t actually touch your feet. Similarly, the metal hinge area near the crank makes the pedal look ‘wider’ than it is (left-to-right), but you can’t actually put your foot on that area! 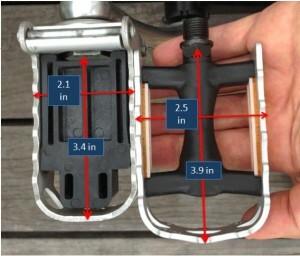 If you take a ruler to it without the reflectors and measure only the area where your foot can rest, the existing Brompton folding pedal is 2.1 inches ‘long’ (front-to-back) and 3.4 inches ‘wide’ (left-to-right).The non-folding pedal on the other hand, is 2.5 inches long and 3.9 inches wide!So the folding pedal is 19% shorter and 15% narrower. 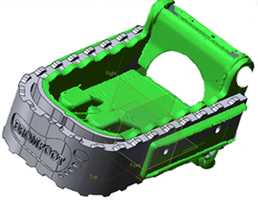 And that gives a pedal platform area (for your foot to rest on) that is 27% SMALLER than the non-folding pedal! No wonder it feels too small! Q: How do I install the BROMFOOT? A: EASY! It can be done by almost anyone in less than 3 minutes, using only a flathead and a Phillips head screwdriver. BROMFOOT attaches to the existing Brompton folding pedal using the same screw holes as the existing reflector housings – but using longer screws that we provide! Watch the video here to see just how easy it is! 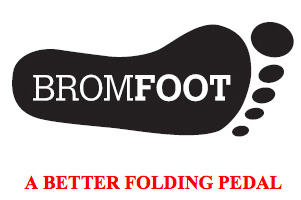 Also, it’s completely reversible – you can remove your BROMFOOT just as easily as you put it on! 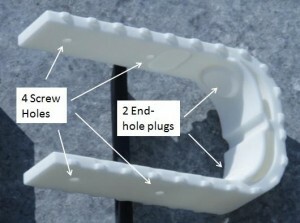 Q: How securely does the BROMFOOT attach to the folding pedal? Q: How strong is BROMFOOT? Will it stand up to the abuse of pedaling? A: Very strong! BROMFOOT is manufactured from glass-reinforced nylon, one of the strongest and most durable plastics out there. Go ahead and stand on it!! A: YES, just not right away. The initial production run is in black only. However, we will be adding Red, White, Orange, Yellow, and possibly other colors if demand is there. So if you want one in color, please go ahead and pre-order! Q: I live in Europe and would like to order a Bromfoot. Will I have to pay customs or import duties? A: Good news! No, you will not have to pay customs or import duties. We have a warehouse in the UK that we ship goods out of for EU customers, so it’s just like ordering from any EU-based online retailer. 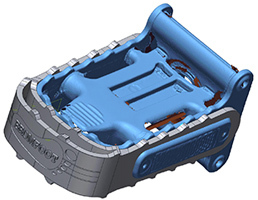 Q: What if I have the new Brompton folding pedal (shipped on new 2012 model year Bromptons)? Will this work? Do I still need one? A: Keep an eye out for BROMFOOT 2! While BROMFOOT will not fit the new folding pedals, we will soon be introducing a version that does, for while the new Brompton folding pedal is now the same length front-to-back as the non-folding pedal, it is still 1/2 inch narrower left-to-right, and it will still scratch your frame if you overfold. While 2012 Bromptons have pronounced crank nubs that mostly prevent overfolding, it can still happen if the pedal is turned while folding. And of course, if you have a Brompton from 2011 or earlier, you won’t have the proper crank nubs and the new pedal can still overfold and scratch your frame (and it will be worse since the new folding pedal has sharper metal edges! ).